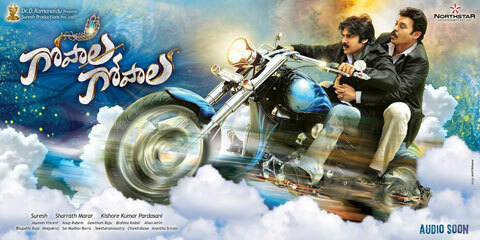 Gopala Gopala is a Telugu satirical drama film produced jointly by Daggubati Suresh Babu and Sharat Marar onSuresh Productions and North Star Entertainments, scripted and directed by Kishore Kumar Pardasany. Starring Daggubati Venkatesh, Pawan Kalyan, Shriya Saran in the lead roles and music composed by Anoop Rubens while Jayanan Vincent handled the film’s cinematography. The film is an official remake of Umesh Shukla’s 2012 Hindi film OMG – Oh My God! about an atheist who sues god. The filming began on June 9, 2014. As of now, the film is scheduled for a January 2015 release.